Flexible Authentication Secure Tunneling (FAST) is part of the framework for Kerberos Pre-authentication. FAST provides a protected channel between the client and the Key Distribution Center (KDC), and it can optionally deliver key material used to strengthen the reply key within the protected channel. With FAST in place, it is relatively straightforward to chain multiple authentication mechanisms, utilize a different key management system, or support a new key agreement algorithm. With FAST enabled and required, brute forcing the reply key is no longer possible and the highest possible cryptographic protocols and cipher strengths are guaranteed to be used by Windows 8 clients in their pre-authentication traffic with Windows Server 2012 Domain Controllers. When FAST is required, this enables the Compound Authentication functionality in Dynamic Access Control (DAC), allowing authorization based on the combination of both user claims and device claims. 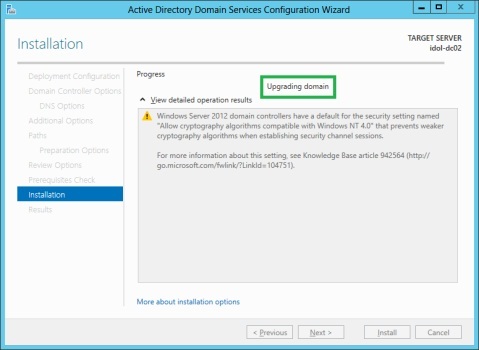 When you choose the ‘Supported’ setting and link the Group Policy to the Domain Controllers Organizational Unit (OU), it’s time to enable Flexible Authentication Secure Tunneling (FAST) on the Windows 8 clients. 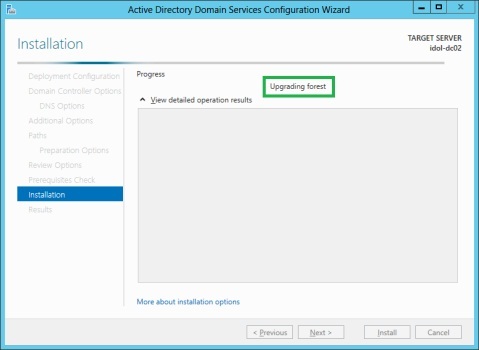 You will have Flexible Authentication Secure Tunneling (FAST) on your network between domain-joined Windows 8 clients and Windows Server 2012-based Domain Controllers after the next Group Policy refresh cycle. Requiring Flexible Authentication Secure Tunneling is the next step. 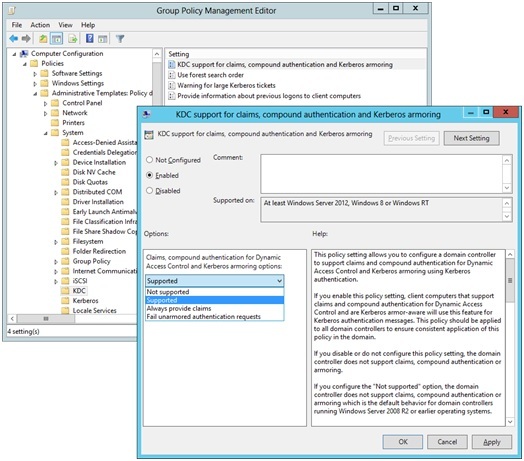 You will still use the Group Policy Management Console (GPMC) as your tool of choice, because a couple more Group Policies need to be configured. 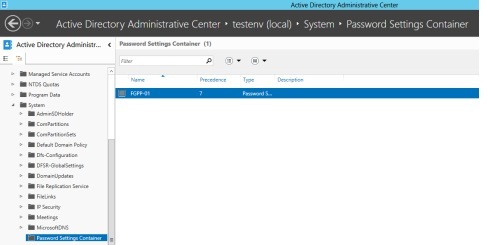 Assign a Group Policy object to the Domain Controllers Organizational Unit (OU) and within the Group Policy object, again, navigate to Computer Configuration, Administrative Templates, System, Kerberos. 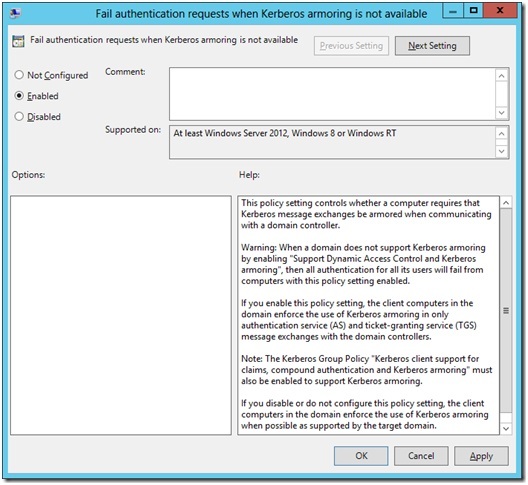 Here, enable the Fail authentication requests when Kerberos armoring is not available Group Policy. 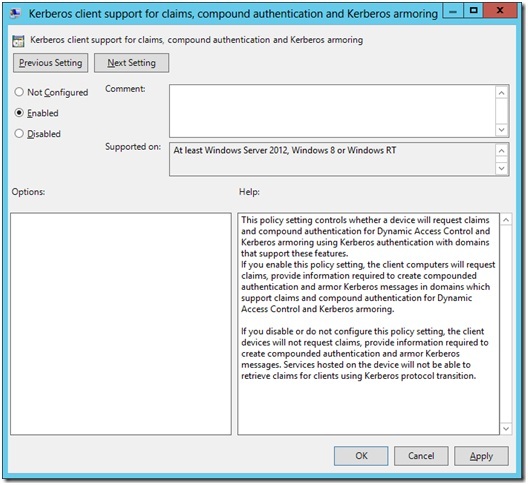 Lastly, the above mentioned Group Policy KDC support for claims, compound authentication and Kerberos armoring, located in Computer Configuration, Administrative Templates, System, KDC needs to be configured with the Fail unarmored authentication requests setting. Sufficient Domain Controllers are running Windows Server 2012, with sufficient processing power (to additionally encrypt Kerberos messages and sign Kerberos errors on top of the baseline processing power needs) and networking connectivity (to handle the additional message exchange and increased Kerberos services tickets on top of the baseline networking connectivity needs). 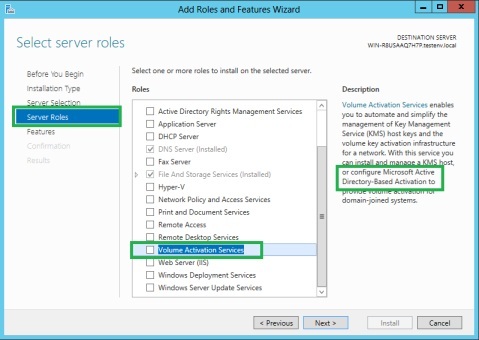 When FAST is enabled Windows 8 clients will only communicate with Windows Server 2012 Domain Controllers. This might create a pile-on effect. Therefore, ensure you have sufficient Domain Controllers to prevent authentication traffic passing Active Directory site links. The environment no longer contains domain controllers running Windows Server 2003. Supported Domain Controller Operating Systems include Windows Server 2008, Windows Server 2008 R2 and Windows Server 2012. 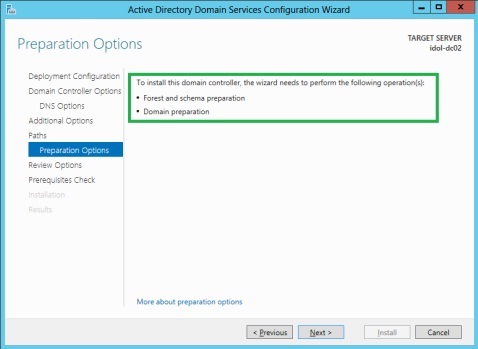 All domains the client uses are running the Windows Server 2012 Domain Functional Level (DFL).